Earth Mama Angel Baby Natural Stretch Oil | Ease Pregnancy Symptoms Naturally and Effectively! Are you an Angel Mama with a sensitive nose and an itchy, pregnant belly? Looking for the perfect natural stretch mark oil? Mama knows. That's why Natural Stretch Oil is exactly what every mama needs. Your gloriously expanding belly, hips and breasts will drink up the luxurious, natural blend of oils to help deter stretch marks and relieve the itch, and the light, delicate scent won't aggravate morning sickness. Mama starts with plant-based oils that are infused with the healing herbal goodness of organic calendula and calming organic chamomile. Organic borage oil and neroli pure essential oil help nourish and encourage skin's natural elasticity for natural stretch mark care. 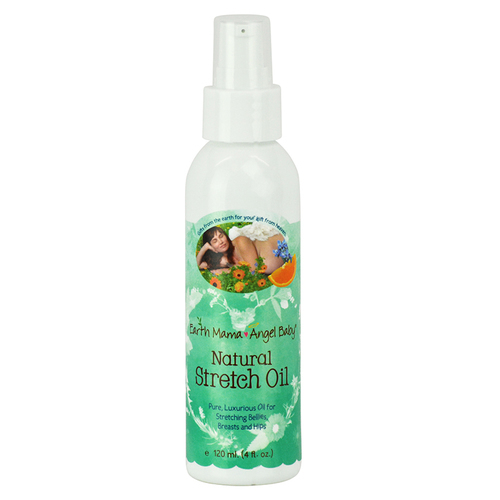 Natural Stretch Oil is light and readily absorbable. It's vegan, cruelty-free and toxin-free (no artificial preservatives! ), and contains no nut oils. It's lovely as a bath oil and perfect for perineal massage to help avoid tears and episiotomies during natural childbirth. Imitation is the sincerest form of flattery, but don't be fooled: this is Mama's secret blend to help prevent pregnancy stretch marks naturally, perfected with loving care, with a celebrity and celestial mama following to prove it.